In the water or at your local surf shop, most likely you’ve seen the popular and sleek design of bamboo paddle boards that are dominating the SUP market. The bamboo surface finish on these particular paddle boards is not only appealing and stylish, but can also be recognized as a throwback imitation to primitive paddling crafts many tropical tribes used for traveling, fishing, and hunting. Bamboo has the highest strength to weight ratio of any natural fiber, is a light weight material, and remains extremely buoyant while under weight. On top of its natural and primal appearance that triggers a rider’s water lust, there are multiple benefits that bamboo composite adds to the paddle experience. 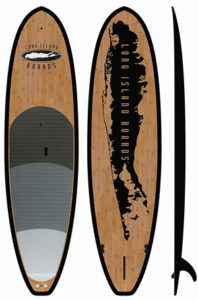 Many SUP manufacturers are transitioning to the bamboo design for multiple reasons. Bamboo has the highest strength to weight ratio of any natural fiber, is a light weight material, and remains extremely buoyant while under weight. These brands are our top nine list of the most popular and affordable Bamboo paddle boards. Hailing from one of the most popular beaches in the nation, Long Island brings greatness to stand up paddle boarding. One of Long Island Boards’ most versatile stand up is the Montauk. Great for beginners or the experienced rider, the Montauk is able to hold serious weight while offering sufficient stability. The extra-large bottom graphic represents the true coastal culture of Long Island and the boldness of New York. This board performs well in the surf or as a strong yoga platform in calm water, maintaining a buoyancy of up to 450 Ibs. The double sided bamboo veneer reduces the weight of the board making for a smooth and enjoyable ride. Being that these boards are handcrafted, you know the quality of the board won’t be that of the cookie cutter brands. Riders swear on this board’s performance and ease of maneuverability in the surf or backwater channels. There aren’t too many cons about this board other than the black rails, if you are a rider seeking more of a colorful expression on the water. However, the bamboo color with black trim is an aggressive and tactical look on the water. Max. weight capacity: 450 lbs. The Surftech Generator is the ultimate shape for intermediate surf or backwater riders. Its solid foundation and simplistic bamboo deck offers a stable and symmetrical ride, and with a bamboo fused-cell core stringer down the middle, the strength of this board is above the typical plastic or foam made stringers. Right above the divided traction pad are anchored bungee connections for tightly securing your belongings. The pintail makes it easier to propel through the water and easily access multiple turning and cutback maneuvers in the surf. However, the tail may slightly limit the stability for beginning riders. None the less, the board is easily adaptable to all levels of experience. This board comes at an affordable price for riders who want an upgrade from the beginner board they learned on. It’s slightly on the heavier side, but remains a durable and versatile paddle board. Wappa Paddle Boards are known to the paddle board community for being environmentally conscious. They use imported bamboo from China and an eco friendly epoxy resin that keeps the outer layer of their boards strong and toxic free. 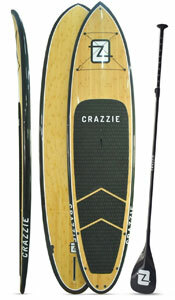 Their line of bamboo models have an all natural look with wild-style graphics and a unique cross-hatched traction pad. The squash tail makes for great stabilization for beginners and surprisingly for how thin the rails are, at 4.5 inches, it can easily float anything less than 215 Ibs. The thin rails also provide a quicker glide through the water. 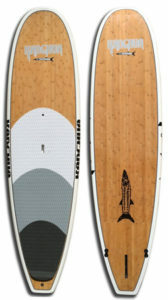 The stub nose is quite an unusual look for the common paddle board shape, but the board does come equipped with a Go Pro mount on the top rocker, and has two Gore-tex air vents on the tail. This technology reduces the possibility of any internal water damage and unwanted dents or dings. The Wappa Nova also has a three fin system, which is great for paddle surfers who want more stability when riding the waves. 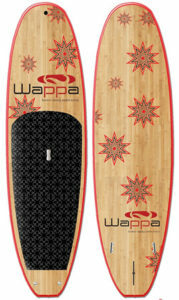 Wappa is a great beginner and intermediate board for beach goers, river chasers, and backwater paddlers. The Kanghua boat company has more than twenty plus years of experience from all aspects of watercraft technology. With multiple designers behind their brand, Kanghua not only makes SUP boards, they are also involved in the sport of rowing. The watercraft company is well aware of the ins and outs of creating a stylistic and durable paddle board for the common and advanced rider. 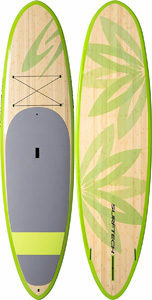 This board is built to satisfy all skill levels and the double bamboo vacuum construction and high density foam makes it light in weight, and comes in two types of trim: White rails with white foam traction, and the true roots Rasta pattern of red, green, and yellow, with a white foam traction pad. It is also equipped with a two way breather valve to prevent delamination. The Kanghua All Around Performance Bamboo SUP is the perfect board for all riders, conditions, and aquatic environments. 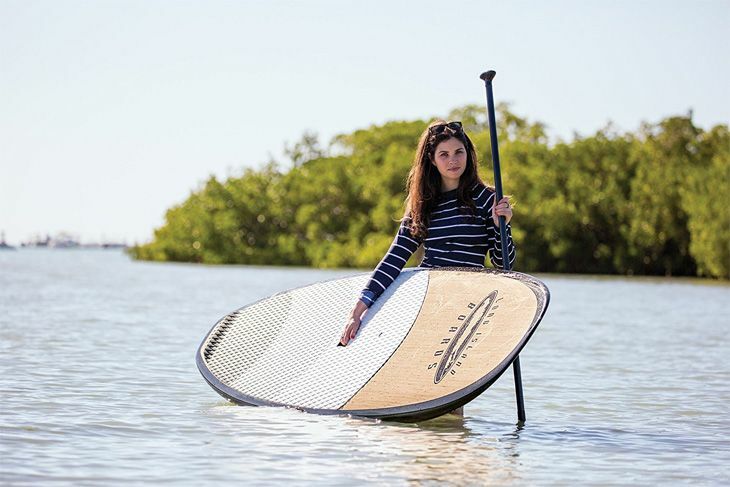 The Levitate Stand Up Paddleboard from Levitate has unmatchable features. 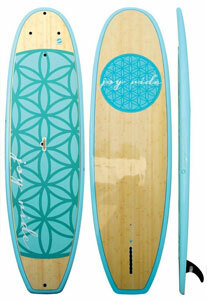 It is perfect all around and is built much like a surfboard, except it has extra fiberglass for durability. 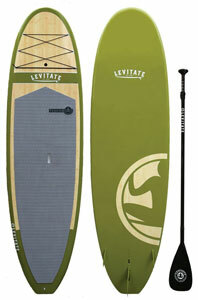 The Levitate paddleboard is a premium and rigid board, unrivaled with inflatable alternatives. Its top-notch carbon fiber paddle is adjustable and comes with stainless steel locking components. One feature you cannot fail to notice when you use this paddleboard is its lightweight and sturdiness. The board is skillfully handcrafted with three layers of fiberglass cloth, both top and bottom then given a hand sanded finish. The levitate board is suitable for people 215 lbs and below. This classic bamboo paddleboard from Crazzie has black rails which makes it a beautiful piece of artwork that can make your friends jealous. It has extra straps to hold most of your gear such as sunscreen, your PFD, fishing gear, cooler or camera. The board is very light (under 30 lbs) and has a center handle to make your work easier while carrying it. It has a smooth epoxy clear coat with a dense EPS foam core for that stylish finish that is hard to look away from. It also comes with an adjustable carbon fiber paddle. The 10’6” Crazzie Classic Paddle is custom painted with Rasta colors at the top and real light bamboo wood overlay at the bottom. 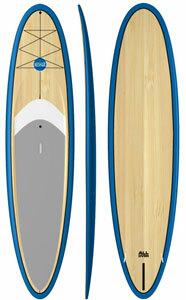 The Tuga Tiff Bamboo board is your ultimate flat water board. It is stable and has a low rocker that makes it suitable for exercise and yoga. The volume is efficiently distributed so you can comfortably paddle for long distances. Another incredible feature is its raised deck and Futures side fins which make it ideal for surfing small waves. Now this paddleboard comes loaded with exciting extras like a side-paddle-bungee, a cargo bungee at the nose and a nose GoPro mount. One more thing, the Tuga design team is made up of experts and certified instructors so you can trust that it was made by people who knew what they were doing. The Boardworks buoyant and stable SUP lets you bring yoga to the water. The board has a bamboo deck that is quite robust and durable so you can be sure that you are getting your money’s worth. It has beautiful graphics, and you will definitely stand out among your friends with this shiny Joyride flow. The Yoga Mat style pad offers traction and is built from Non-Chaffing Soft Croc Skin EVA that enhances comfort and stability as you hold and shift various poses. Glide gracefully to whatever position as you enjoy the ease that comes with doing yoga on this fantastic SUP. The Broadworks board includes several Connex Deck Plugs to help you transport gear or anchor down. The Kona Wood All Over SUP is the ideal board for people who are looking for stability, versatility and exceptional wave riding performance. Thanks to its unique performance outline, recessed deck and pulled in pintail, you are guaranteed of a breathtaking SUP experience. The key specifications for this classy paddleboard include a painted gloss finishing, a rounded tail, and a flat to slight V contour; all of which are built to enhance your experience. The tail’s design is one of a kind, single to double concave to V out, for you to ride a wide range of different breaks or SUP in open water. The Kona All Over ensures that riders have it all on one board. So, if you are new to the sport of paddle boarding, or you’re a salty paddle boarding warrior looking to upgrade and purchase something new, an eco friendly and durable bamboo crafted paddle board will do the soul, and the environment good. It will withstand the elements of surf, sand, and sun, and most likely outlast the typical inflatable or plastic style paddle boards. Not only does the woody bamboo style catch the looks of other paddle boarders and beachgoers, it adds a retro-surf feel to your home or garage. The bamboo material makes for a durable and fluid ride and is extremely eco-friendly since bamboo grows strong as well as rapidly over a short amount of time. Paddle boards will continue to evolve over the years, however the different combinations of bamboo crafted models will always thrive in performance for the casual, and expert paddle boarders.